Support 210 Amlent Avenue going to NYMF! Our musical 210 Amlent Avenue has been accepted into the 2015 New York Musical Theatre Festival (NYMF)! This means the show will have its first fully-staged production this July, complete with professional actors, costumes, sets, and everything else you’d expect to see when you attend a musical in New York City. But we need your help to get there! NYMF will provide us with a theatre and technical framework, but beyond that we are acting as self-produced writers, so we need to raise the entire cost of the production before we start rehearsals. We want to bring this show to an incredible audience of industry professionals and musical theatre fans, and your tax-deductible donation will help us get there! No amount of support is too small. We’ve been developing 210 Amlent Avenue for five years and the piece has grown and evolved so much in that time. The characters, story, and songs have really matured and being selected by NYMF tells us that the show is ready to be seen by a wider audience. This is the same festival that launched the lives of plays like Next to Normal and [title of show], and we want to take advantage of this extraordinary opportunity! Please consider making a donation and joining us on this adventure. * donations are tax deductible to the fullest extent permitted by law. We’ve crunched the numbers and will need $45,000 total to mount this production. We are so excited to have this opportunity, and you can help us get there! Through NYMF, we are able to accept tax-deductible donations for this project. 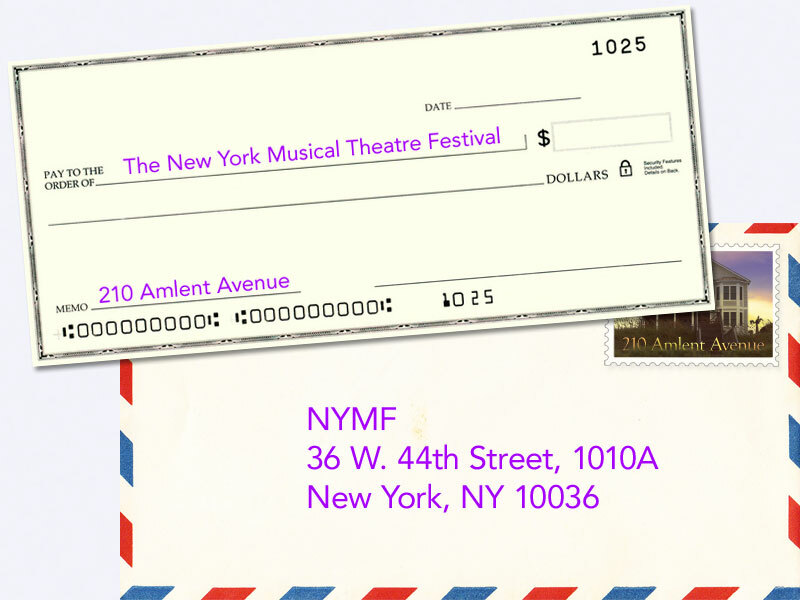 You can donate by making out a check to “The New York Musical Theatre Festival” with “210 Amlent Avenue” written in the memo, and mail it to NYMF at 36 W. 44th Street, 1010A, New York, NY 10036. Include your email address for quick acknowledgement of your donation. Spread the word about 210 Amlent Avenue, linking friends to our Facebook, Twitter, and Instagram. Come see the show! Tickets will go on sale later in the Spring. Click here to tell your Facebook friends about this campaign – every little bit helps! This is a show and a story that we really believe in and we are ready for the opportunity to present our work in its first real production this July. We appreciate any help you can give! PS: Feel free to email us with any questions about the campaign. We want to keep you in the know! You will get the satisfaction of knowing you helped to make our dreams come true! You will receive a heartfelt social media thank you from our writers. All of the above and Becky will write you a personalized limerick. Plus we’ll send you a 210 Amlent Avenue sticker to adorn your car, fridge, or forehead! All of the above and we’ll send you a demo “cast recording,” featuring MP3s of all the songs that helped us get selected for this year’s Next Link Project. All of the above, a signed page from the script, and Karl will write you a personalized song. All of the above and a signed CD from the 2012 version of the show, featuring five songs that have been cut from the current production! All of the above, including an “Associate Producer” credit in our program, two tickets to the show, plus a backstage pass to attend a rehearsal! All of the above, six tickets to the performance of your choice, our heartfelt gratitude, and as a special thank you, we’ll credit you as “Producer” in the program. Did you know you are awesome? You’ll get all of the cool rewards above, and as a super-special thank you, you’ll become an Executive Producer on our show complete with a “presented by” credit on the title page of our program and all promotional materials.